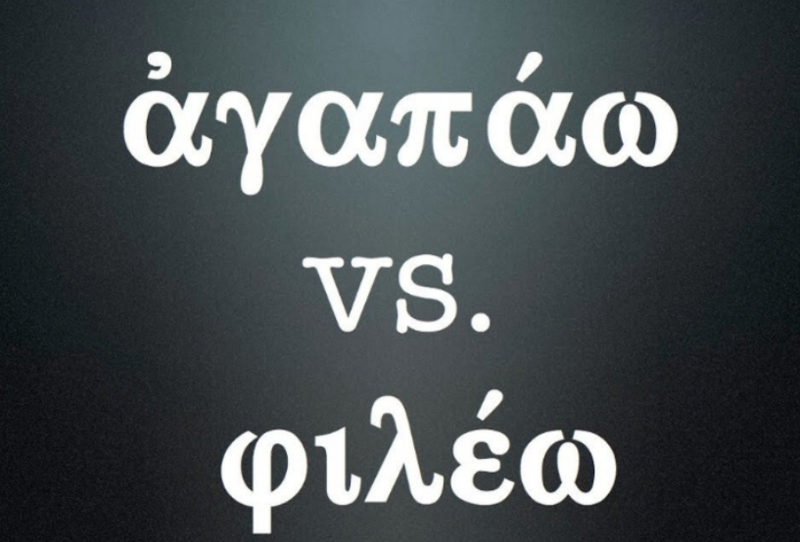 Let’s stop over-interpreting the Greek words for love. 15 When they had finished breakfast, Jesus said to Simon Peter, “Simon, son of John, do you love me — agape love — more than these?” He said to him, “Yes, Lord; you know that I love you — phileo love–.” He said to him, “Feed my lambs.” 16 He said to him a second time, “Simon, son of John, do you love me — agape love — ?” He said to him, “Yes, Lord; you know that I love you — phileo love –.” He said to him, “Tend my sheep.” 17 He said to him the third time, “Simon, son of John, do you love me — phileo love –?” Peter was grieved because he said to him the third time, “Do you love me? — phileo love –” and he said to him, “Lord, you know everything; you know that I love you — phileo love –.” Jesus said to him, “Feed my sheep. I remember thinking that it would be cool to have such amazing “insight” back then. Problem is, it’s not really insight at all. It’s actually a case of over-interpreting Greek synonyms, and then making more of the over-interpretation than the text would ever lead anyone who actually knows better to make. I have sat through more sermons than I can count and listened to pastors give protracted overviews of the (so-called) “three kinds of love” in the Bible. This is what we may call “Strong’s Concordance” Greek. It’s done by lots and lots of people who have learned to look up the lexical forms of Greek words in their Strong’s Concordance without knowing much of anything about Greek grammar, or the ways in which word usage is a primary aspect of determining word meaning in Biblical literature (just as it is in our own language and literature). These gaps in understanding often lead to these kinds of exegetical fallacies that come off sounding deep and insightful to others who are just as uninformed. Additionally, these Greek gymnastics actually lead to missing the actual point of a text that is often right in front of our faces in favor of more “oooh-aaaaah deep and insightful” conclusions that are really not good conclusions at all. In reality, when Jesus was asking if Peter loved him (agape love), and Peter was answering that he loved Jesus (phileo love), they both would have understood that their words were completely reasonable synonyms. The third instance in which Jesus asks Peter if he loves him (phileo-love) is interpreted by the narrator, John, to be a repetition of the first two occurances, in which Jesus uses agape (cf. Jn. 21:17). The point of Jesus’ thrice-repeated question to Peter is not secretly hidden from our English-speaking eyes in the use of two different Greek words. Rather, the point is that Jesus, sitting by a fire made with charcoal, fully restored Peter by giving him a three-fold opportunity to undo what he had done three times by another charcoal fire three chapters earlier (see Jn. 21:9 and compare Jn. 18:18). What Peter had done three times by the first charcoal fire (denied that he even knew Jesus) he reversed, with the help of Jesus, three times by the second charcoal fire (confessed his love for Jesus three times). Hover over these references to see them if you like (Jn. 3:16, 3:19, 3:35, 8:42, 10:17, 11:5, 12:43, 13:1, 13:1, 13:23, 13:34, 14:15, 14:21, 14:23, 14:24, 14:28, 14:31, 15:9, 15:12, 15:17, 17:23, 17:24, 17:26, 19:26, 21:7, 21:15, 21:16, 21:20). People loved (agape love) the darkness rather than light in Jn. 3:19. The Pharisees loved (agape love) the approval of men more than the praise of God in Jn. 12:43. Does John really mean to say that people had God’s perfect self-giving unconditional and holy love (the supposed and often-asserted meaning of agape love) for darkness and the approval of men? Be honest, doesn’t that sound weird? Yes it does. And when we load up Greek words with meaning that they don’t always have (ignoring situational usage as the key to word meaning), we won’t land in the right place. Okay, but what about Phileo love? Hover over these references to see them if you like (Jn. 5:20, 11:3, 11:36, 12:25, 15:19, 16:27, 20:2, 21:15, 21:16, 21:17). Lazarus, who Jesus loved (phileo-love) was sick in Jn. 11:13 and 11:36. God The Father loves (phileo-love) the disciples because the disciples love (phileo-love) Jesus in Jn. 16:27. After Jesus was raised, Mary Magdelene came running up to Peter and the disciple who Jesus loved (phileo love) to tell them the body of Jesus was gone in Jn. 20:2. Again, if phileo-love is categorically not the unconditional “God kind” of perfect love, and is by nature and essence necessarily lower in quality than agape, then why can’t the Father love the Son with agape-love? Why only phileo-love? Why doesn’t the father love the disciples with agape-love, and only love them with phileo-love, and why do the disciples only love Jesus with phileo-love? Surely, God could love them with agape-love and not this lower form of love! After all (we are told) agape is way better than phileo! And why can’t Jesus love (with agape love) this disciple who is with Peter? Why can’t Jesus muster up the best and highest kind of love (agape-love) for his own disciple? Here’s the answer to all these questions: Both agape and phileo can be used as synonyms, and it is the usage in the context of conversation or narration that tells us the degree of love or the object of love in focus. So — let’s stop over-interpreting the Greek words for love. UPDATE (on 4.2.18) – Josh Shoemaker had some really great comments below, and linked to a post that he wrote back in May of 2015 that is incredibly helpful. See his post HERE, and then my exchange with him in the comments below for a possible better and perhaps more natural reading of the text where the implications of both agape and phileo are taken into account. 15 When they had finished eating, Jesus said to Simon Peter, “Simon son of John, do you love me more than these?” “Yes, Lord,” he said, “you know that I love you like my own flesh and blood. You are family to me.” Jesus said, “Feed my lambs.” 16 Again Jesus said, “Simon son of John, do you love me?” He answered, “Yes, Lord, you know that I love you like my own flesh-and-blood brother — like my own kin!” Jesus said, “Take care of my sheep.” 17 The third time he said to him, “Simon son of John, do you really love me like your own brother — like your own flesh and blood?” Peter was hurt because Jesus asked him the third time, “Do you love me like your own brother?” He said, “Lord, you know all things; you know that you are family to me. I love you as though we were brothers — like you were my own flesh and blood!” Jesus said, “Feed my sheep. Thanks Josh! I think you have given me my new-and-improved perspective. Update (on 4/10/2018) — After Brian Fulthorp’s great reminder in the comments below that “even sinners agape-love others,” I thought I’d just go ahead and list every occurrence of love in the N.T. in which it’s obvious that sinful people are the ones doing the agape-loving (supposedly God’s perfect love), or people are agape-loving things they should not (how is that possible if agape is God’s perfect love?). Hover over every text below. In each case, the English word for love is a form agape in Greek. Mat. 5:46, Lk. 6:32, Lk. 11:43, Jn. 3:19, Jn. 12:43, 2 Tim. 4:10, 2 Pet. 2:15. And finally, those who translated the O.T. into Greek (the LXX/Septuagint) did not seem to think that agape meant God’s holy, perfect, and unconditional love. If they did, they never would have used agape to refer to anything but God’s perfect and holy love. Is that what they did? Hover over a few examples below to see. All of these use agape in the LXX. Ps. 4:2, 52:3-4, Prov. 1:22, 8:36, Hos. 3:1, 4:18, Jer. 5:31, 14:10 — and on and on we could go. This is just a sample. Here’s the point. In the end, context and situational usage is the “content” (meaning) that goes inside of and gets hauled around by the “suitcase” (word). Words function as carriers of meaning, and meaning derives from the way in which the word is being used in a particular context. In nerdy language, this is known as the semantic range of a word. One word may have a label on the outside of it that reads “love,” but you can, depending on context, load that word up with the kinds of things that fit in that package. Context and situational usage will always tell you what’s inside the suitcase. There is a range (a semantic range) of possibilities with most words. So, for example, God can agape-love a sinner, and that love will take on the meaning of whatever actions God is demonstrating toward the sinner. In that case, agape will mean whatever it means in that context. Likewise, a sinner can agape-love sin and darkness and self-aggrandizement. In that case, agape will mean whatever it means in that context. Were this not the case, those who had an opportunity to protect the word agape from being used to refer to anything other than God’s perfect and holy love would have done so! My brethren, if you were left to yourselves, you would be overcome by every temptation with which you are beset.